There has been some recent discussion in the Twitterverse about the “state of the nation” for Thinking and Working Politically: specifically whether TWP has already “won” or not, and whether specific tools would be a useful or self-defeating addition to the corpus. Previous posts in my PEA Confessions should make clear my view on the former: personally, I would say that rumors of TWP’s success have been greatly exaggerated. What I want to tackle now is the latter claim. In particular, I am building on a reflection by FP2P on “creating the right (empowering) tools” and a concern raised by Bruce Byiers that “tools lead people towards procedures, which then kill the idea that it is really about a process”. So what is it, then? Will tools empower TWP, or will it turn us into midless automata? I have written things you wouldn’t believe. Country assessment frameworks for social accountability organizations. I watched donors try to coordinate in a small Central American country. All those reports will be lost in time, like tears in rain. Four years ago I published a research paper and policy briefing at ESID that focused on the barriers to political-economy analysis (PEA) in donor agencies. I thought our research gave me a pretty good grasp of the promises and pitfalls of PEA in the aid community. After two-and-a-half years of working as a PEA consultant, the time has come for some self-imposed accountability. This is part I of a new series of posts dramatically called “PEA Confessions”. The fact that I have written a grand total of 7 posts for my own blog in the entirety of 2017 is a testament to the madness that this year has been. Good madness, I must say. None of that Lovecraftian “things-man-was-never-meant-to-see” stuff. But madness anyway. And as I emerge from a cocoon fashioned out of draft chapters and reports, taking up blogging again seems like the perfect New Year’s Resolution for the month of December. Can political settlements theory tell donors how to make ethical choices? New paper! “The role and responsibility of foreign aid in recipient political settlements“. Political settlements analysis has highlighted the role of powerful political and economic actors in shaping institutional outcomes across countries. Its focus on national elites, however, risks biasing this type of theorising towards local factors, when in fact many policy domains in developing countries have become transnationalised: much like private finance or transnational activism, foreign aid can play a significant role in shaping political settlements, for instance those underlying public finance management or basic service delivery. This paper has four aims. 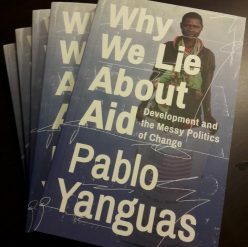 First, it revises the basic concept of political settlement with a combination of field theory and contentious politics that emphasises contestation between incumbents and challengers and the mechanisms through which they are affected by transnational forces. Second, based on this conceptual framework, it outlines six ideal types of aid influence over a developing-country political settlement, illustrating donor tendencies to support continuity or change. Third, it investigates the ethical implications of donor influence over political settlements, identifying the types of intervention favoured by consequentialist and non-consequentialist calculations. Finally, the paper presents the kernel for a practical ethic of assistance, which asks whether current debates in the aid community have fully come to terms with the responsibility that derives from agency in the contentious politics of inclusive development. These days I am reading psychologist Daniel Kahneman‘s book Thinking, Fast and Slow (2012), in which he outlines two aspects of our brains which determine how we process information, associate ideas and solve problems. Kahneman speaks of two systems: System 1, which is quick, intuitive, and effortless; andSystem 2, which is slow, analytical, and costly. The first chunk of the book is devoted to the interaction between these two systems, and in particular how System 1 is prone to bias by jumping to unwarranted conclusions on the basis of what’s familiar or sounds right, even without us consciously realising what we are doing; System 2 can then jump in to check our intuitions against facts and avoid logical mistakes, but doing so requires willpower and freedom from disruptive stimuli (we all have a limited budget for effort, be it mental, emotional or physical).